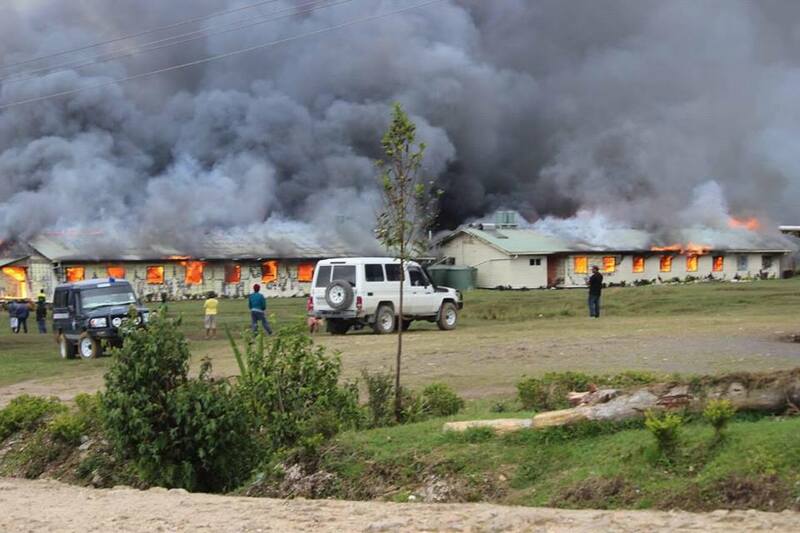 3 dormitories in the Ialibu Secondary School in Southern Highlands Province were set on fire by angry relatives of a man from the Koromi village following a fight between the villagers and the students which injured one of the villagers. The fight which started at the Ialibu station saw shops looted and the district office was also stoned. Ialibu District Hospital Secretary Limu Nimbo confirmed that one student was killed and two others were injured which includes the local from Koromi. Town authorities and village leaders held an informal peace talk yesterday to find the cause of the problem. A student representative, Edward Raimbolo while addressing the people during the informal peace talks said that the problem begin over the principal position of the school. Raimbolo said that the school had been operating with two different principal since the beginning of the year and had affected students learning. "Students were frustrated that the issue was affecting their learning and had gone up to the police station to register their issues when they were attacked by locals from Koromi Village." "Students than mobilized and went back to the Koromi village and fought with the villagers," he said.